Powerful Tale About Rural Justice! India is a country which comprises of rich culture and village life. Basically India is an agricultural country and no matter how much urbanization or globalization happens, the strong foundation of village life still reflects in every Indian’s lifestyle. Another concept of Indian way of living is that of Dharma (Justice). Right from times immemorial, when most of the life rested in Villages, it was the rural landlord (treated as the right person to give justice to the villagers) who gave verdict on people’s issues and provided justice. The Landlord’s family was like a constant driving force for the goodwill of the village, and they set an example for the villagers on how to lead a life with morals. Many films right from the black and white era focused on agriculture, village issues and problems. As Telugu films evolved over time, the village and landlord themed films also changed their course. But it was Pedarayudu which came in early 90s- gave a new trend of Village landlord justice films and created new ripples in Telugu Cinema. It also made the audience remember the foundations of our lifestyle and the lifeline which traces back to the village life and morality. Right to the title, the film’s story revolves around a village landlord named Pedarayudu (Mohan Babu) who is an ideal example of how a life with morals should be led. He solves the problems of the villagers and gives the right judgment for their welfare. His family comprises of his loving wife (Bhanupriya) and two younger brothers Raja (Mohan Babu) again and Raja Ravindra. Raja marries Bharathi (Soundarya) - city bred daughter of a rich industrialist played by Satyanarayana. Seeing her husband being very timid and subservient to his elder brother Pedarayudu, she finds it difficult to adjust in the joint family. But she later understands the greatness of her brother-in-law and apologizes for her arrogance. Things take a different turn when Pedarayudu’s rivals get a school teacher Ramani (Subhasree) to lure Raja and create rift between their family members. Ramani dies in mysterious circumstances and the crime grabs Raja as the culprit. Pedarayudu is caught between his family ties and justice and thinking of his father Paparayudu’s (Played phenomenally by Rajnikanth) unfaltering faith in justice he boycotts his younger brother Raja and family from the village. Paparayudu is one great character who keeps justice all above family and worldly relationships that he punishes his sister’s (Jayanthi) family for boycott for a particular crime. The rest of the story deals about how Pedarayudu finds out the truth and how the family reunites. Mohan Babu excels both as the elderly landlord Pedarayudu and the younger brother Raja. His histrionics shows his experience in dealing any role with ease. For people who have a bias that Mohan Babu can excel only in negative oriented roles, Pedarayudu is a good answer! He has tremendous screen presence in both the lead roles he adorned and gives the aura needed for the film. The dialogue Pedarayudu tells to Bharathi explaining about relations “The relationship between two persons in a family should be like fish and water, but it should not be like a fish and fisherman”. Grammar thappulunte Manninchu, asalu ardhame tappu anukunte kshaminchu” is another highlight for the film. It is another example of how wonderfully Mohan Babu can deal scenes involving sentiment. 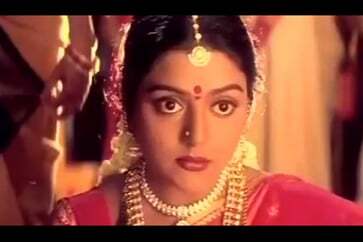 Bhanupriya is ideal as the wife of Pedarayudu, and she has a special folk song “Baavavi Nuvvu” where she shows her dancing skills yet again. Soundarya is very good as the arrogant daughter in law initially but a changed woman later. Pedarayudu is one more film which proved Soundarya was an ideal choice for the family oriented stories in Telugu Cinema. M.S.Narayana, the veteran comedian of Telugu Cinema played a memorable role as Pedarayudu’s assistant Aachari in the film. 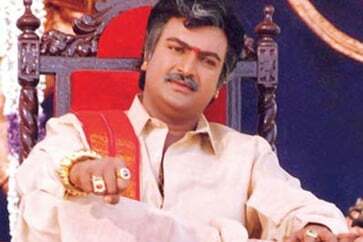 But the star of the film is Superstar Rajnikanth who acted as Pedarayudu’s father- Paparayudu. His amazing style and screen presence took the film to a new level. Dialogue King Saikumar dubbed for Rajnikanth which is another highlight. 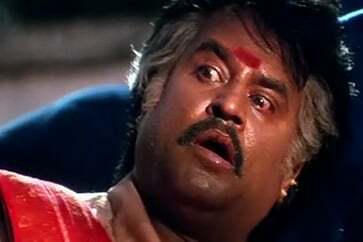 The scene where Paparayudu renders the line “Aapara!” (‘I said, STOP!”) generated unending applause and whistles all over the theatres when the film was released! His role being just 15min of duration in the film, Rajnikanth proved yet again that he can create an impact even with a single frame! Brahmanandam and Babu Mohan’s comedy track gives the good laughs needed for the serious themed film. Rest of the cast was adequate and gave the much needed flavor for the film. The director Ravi Raja Pinisetty handled the complex story dealing with family values and justice with utmost care. The rural backdrop and the styling of each character in the film were brilliantly etched by him. Mohan Babu, who is the producer, did not compromise on the rich production values needed for the film. Music by Koti sets the mood and songs were chartbusters during the time of its release. The background score especially for Paparayudu’s flashback episode was done very well. Story by K.S.Ravikumar, a popular director from Tamil Cinema is well designed in plot and deserves much applause. Pedarayudu is a remake of Tamil Superhit Nattamai (1994) starring Sharath Kumar and Khushboo in lead roles. It was directed by popular Tamil director K.S.Ravikumar. After the Telugu version was successful, it was remade in Hindi as Bulandi starring Anil Kapoor and Raveena Tandon in lead roles. Rajnikanth played the flashback episode in the Hindi version as well, gaining more applause. It was yet again remade in Kannada as Simhadriya Simha in 2002 with Vishnuvardhan adorning the lead role. 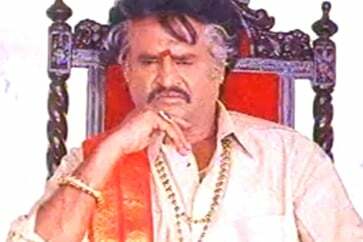 Rajnikanth’s mannerisms as Paparayudu in the film gave it a new style. The way he throws the pipe into his mouth to smoke or the way he turns his scarf which means that the judgment is finalized, became a trendsetter for many more films which came later. Pedarayudu was followed by many family oriented films from then, which involved justice system and village lifestyle - reviving the indigenous theme in Telugu Cinema. The song sung by Yesudas “Kadhile Kaalama” is termed as one of the best melodies in 90s era of Telugu Cinema.